To be honest, I'm not exactly sure what I've found. 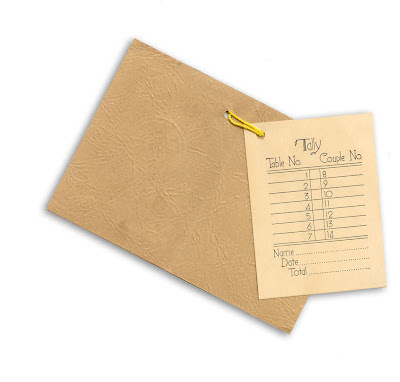 Small, 2 inch by 3 1/2 inch "Tally" booklet. Cover is embossed paper with cameo decoration, paper inside is thick stock cardboard, bound by yellow thread with reddish tassel at the end. 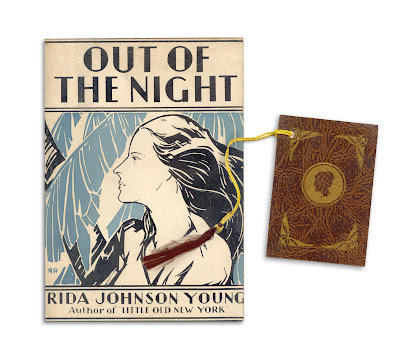 Found in "Out of the NIght" by Rida Johnson Young. Published by Jacobsen, 1925. My guess is for a card game... perhaps euchre or bridge? Maybe a giveaway from a card party or some such. Yep...looks like a bridge tally to me. My grandma used to have bridge parties...this is a bridge tally with a pretty little cover for it. Very nice! Oooh - I thought some kind of dance card too, but a bridge tally makes more sense. (I don't play bridge, so I wouldn't have thought of that).